There is a belief among some circles that “it’s easy to take a basic shed and convert to to a house or granny flat and this makes it a cheaper way to build”. Now please don’t get me wrong: if you want to buy a shed (a “Class 10” shed building) and then convert in into a house or liveable dwelling (a “Class 1” or “Class 1a” building), then that is certainly possible. But it’s important to get the correct advice first. The main thing to decide what you’re trying to achieve. If you’e after a weekender or a shack in the bush and you don’t want it too fancy, then a shed is fine. But if you want to deck out the entire inside to be like a normal house, why not just build a normal house? Not only will it probably be cheaper in the long run, but you’ll also enjoy a far better resale value. Suppose you spend $100,000 building a shed and converting it to a house. The prospective buyer is likely to look at it and think “this is a shed converted into a house, so they obviously did this on the cheap. It’s probably worth $70K-$80K”. However, if you were to spend $100,000 building a similar normal home, the prospective buyer may be more likely to think, “nice house, probably worth at least $120,000”. 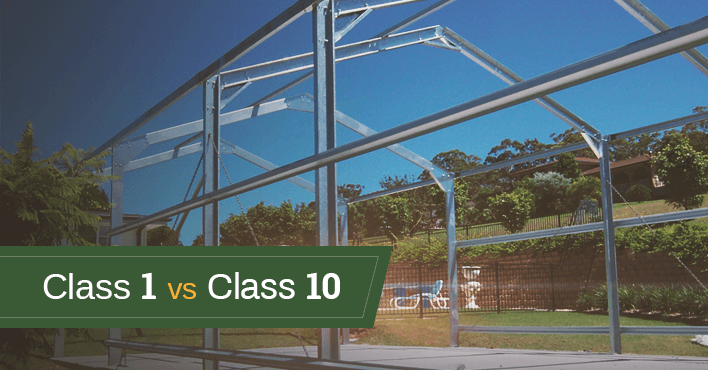 The differences between a Class 1a “home” and a Class 10 “shed” are more than skin deep. Let’s look at a couple. A Class 10 shed building is engineered such that it will not be structurally damaged in a wind storm for the design speed indicated by the authorities. At the peak of the storm there will be flex and movement of the frame, but it won’t fail. As it’s not lined internally, flex isn’t a problem. A Class 1 building on the other hand is fully lined internally. That’s why it needs to be engineered such that at the peak of the storm, there is no frame movement that would crack and destroy the internal lining. Too many of these so-called “liveable sheds” or “granny flat sheds” are built on a standard shed slab, which is not even close to good enough. A Class 10 building may have cars or tractors parked in them. But because they are not lined, if there’s a little settlement in the slab, the shed frame will give a little to accommodate this. By contrast, a Class 1 building can’t have any settlement at all or the internal linings will develop large cracks. That’s why a Class 1 building requires a significantly stronger slab with much more substantial footings. The list of differences goes on and on, including differences in requirements around vermin proofing, termite control, energy efficiency and more. None of these differences are insurmountable, but the time, effort and money you spend on them may well outweigh the benefit. You need to do your homework. Now let’s move onto the actual structural design. It’s true that you can get a Class 10 portal frame building to a weather proof lock up stage cheaper the a Class 1 stud frame and truss building. It’s the fitting out where the costs escalate. Class 10 buildings are not designed to be lined. Even if you take away the wall girts and put in stud frames, the roof area is still going to difficult to line. This is because you can’t fix plasterboard to the bottom of the roof purlins as they will flex just by walking on the roof. If you’re going to build a stud frame on the inside of the shed frame to attach your lining, then you don’t need a separate shed frame – because whatever exterior cladding you choose (even Colorbond Steel) will fix just as easy to the stud wall frame. Now that you have the wall frame in place, you might as well sit trusses on the top of them as this will then make lining your ceiling inside dead easy. You fix it directly to the bottom cord of the truss. Everything else you do from here will also be much cheaper and easier with the stud frame and trusses. For example, things like window reveals (i.e. window frames). In a shed design with a stud frame inside for lining, the reveals are much larger and as such, they need to be custom made. That means they’re also a lot more expensive. Yet with a Class 1 stud wall frame design, things like this are standard because normal builders are doing them every day. Finishing off architraves and skirtings is also much quicker and easier. Saying all this doesn’t mean you have to use a full builder. There are many frame and truss companies that will help with your design and sell direct to you. There are several companies around the country that build standard design houses in a factory and can deliver them to site fully finished or in two or three segments that bolt together once on site. These houses can be very well appointed and extremely good value for money. Knowing all this, if you still want to build a Class 1 building out of a Class 10 design, we’re happy to work with you to come up with a shed design that will suit your needs. However, it will still be a Class 10 building that will need converting into a Class 1. Good sound advice, thank you for taking the time to write this and in such a straightforward way. We will be building a granny flat and will start to plan it next year and will talk to you on the basis that you are trustworthy and tell it as it is.